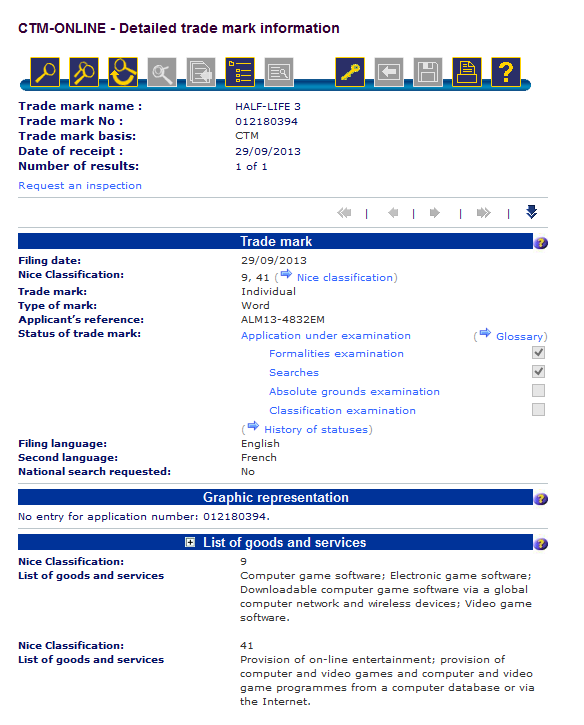 Or so says a Reddit post showing off a European trademark filed by Valve for Half-Life 3. Yes, it appears the highly anticipated AAA title is officially one step closer to happening. The filing first surfaced courtesy of NeoGAF forum member shinobi602. It was submitted to the OHIM, the EU's official trademark office, on Sept. 29. While it doesn't reveal anything about the next Half-Life, the filing classifies the trademark as belonging to "computer game software; electronic game software; downloadable computer game software via a global computer network and wireless devices [and] video game software." Bellevue, Wash.-based Valve is listed as the trademark owner. Gamers have been waiting for Half-Life 3 for what feels like a figurative lifetime, but it really has been years since the last Half-Life was released. Last week, Valve made a trio of announcements related to its Linux-in-the-living-room push, including SteamOS, Steam Machines and the Steam Controller. 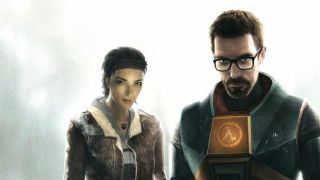 Many expected and hoped Half-Life 3 would be unveiled as well, but the last ticker counted down and HL3 was nowhere to be found. With the trademark discovery, it seems only a matter of time before Valve makes the Gordon Freeman-driven title official. Of course, securing a name isn't water-tight confirmation the game is in development, especially when one of the franchise's lead voice actors said in August that mountainous obstacles stand in HL3's way. Valve could have smelled a trademark troll and wanted to get its paws on the moniker before someone else snagged it. Still, we're placing our bets on seeing the Half-Life's dystopian world come back to life sooner rather than later. We've asked the company for comment on the filing and will update this story if we hear back. Think Half-Life 3 is one of the most eagerly anticipated games of its generation? Patrick Goss sure does.